A lichen is made up of at least two living things – a fungus (which cannot make its own food) and an organism that photosynthesises (makes food using sunlight), such as an alga or a cyanobacterium. Together, they form the lichen’s body. The fungus receives food from the photosynthesising partner. In turn, the alga or cyanobacterium is protected from the outside environment and gets water and minerals from the fungus. Unlike most plants, lichens can survive long dry spells. When it is dry, their processes shut down. When the rain comes, they absorb water and their processes start again. Many lichens make chemicals called lichen substances that protect them from harsh sunlight or to poison the insects that eat them. Some lichen substances protect the lichen from air pollution. Crustose lichens form a powdery, scaly or tough coating on soil, rock or bark. Foliose lichens look like leaves or flat sheets. Often the lichen is divided into lobes. They are common on tree trunks. 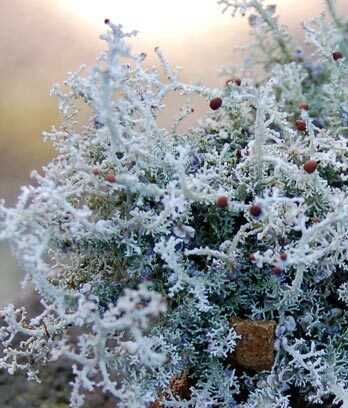 Fruticose lichens look like miniature shrubs, strands of hair, or tangled balls of wool. New Zealand has at least 2,000 lichen species. They can be found all around the country. Different lichens flourish on coastal rocks, in cities, in damp forests on soil, bark and leaves, on mountain rocks, in exposed bogs, and in shrublands.